Boris Uan-Zo-li’s artwork reflects his fascinating life, big, bold, varied and colorful. His work is abstract, but his figures are identifiable like the portraits of Woody Allen and personal hero Bob Dylan. Boris was born in Moscow, Russia, in 1938. During the Soviet times, Boris participated in four exhibitions and at one of the exhibitions in the USSR his paintings were withdrawn from the gallery by the Soviet bureaucrat because they did not fit the communist vision. 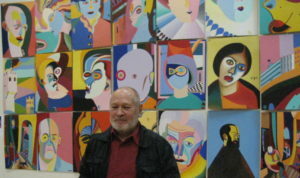 After the fall of communism, Boris’s paintings were exhibited in a number of places, including the Central House of the Artists, one of the most prestigious Russian exhibitions.